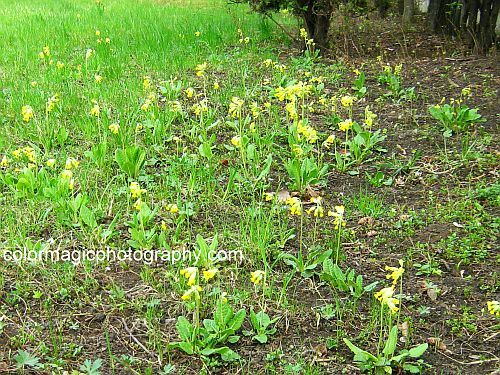 Cowslip-Primula veris, is a pretty wildflower in the genus Primula, native throughout most of temperate Europe and Asia. 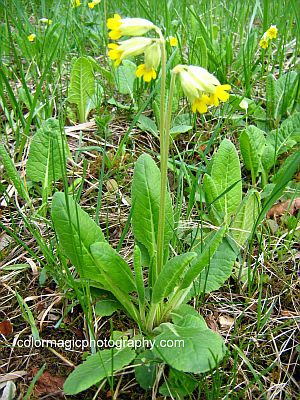 In older days, Cowslip was frequently found on open fields and meadows but, unfortunately, the plant has been picked almost to extinction, due to its sedative properties. As so many other wildflowers, it is known under many names in folklore. Some of these names are "Herb Peter", "Key of Heaven", "Key Flower". Cowslip leaves are produced early in spring and they are very similar to that of a Primrose, but shorter and rounder. The leaves form a rosette that lies flat on the ground. In April and May, a long stalk rises from the center of the leaf rosette, holding an umbel of 10-30 tiny, yellow flower. Each little flower has a separate little stalk, starting from the same point. The flowers have a very distinctive, fresh fragrance. In olden days, Cowslip flowers were in great request for home remedies, as well as for culinary purposes. 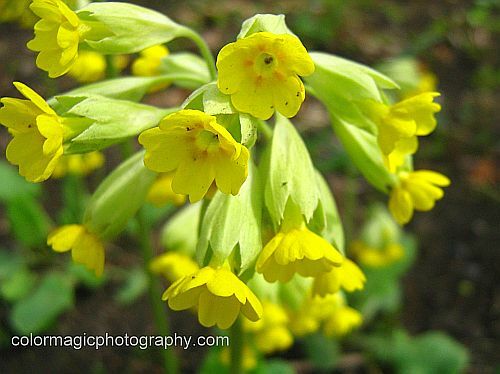 The flowers of cowslip contain a narcotic juice and are used in making the fermented liquor called Cowslip Wine. Young Cowslip leaves were at one time eaten as a salad green in Spanish cooking. Infusion of flowers is used to treat insomnia and restlessness, the flowers possessing antispasmodic and sedative properties. The above mentioned cowslip wine is said to be an excellent sedative. 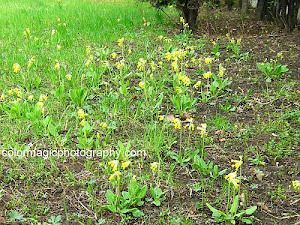 Cowslip is considered beneficial in all paralytic ailments, hence its other name "Herba paralysis" or "Palsy Wort". The roots are used in treating chronic bronchitis, febrile condition and flu. the plant is rich in salicylates, which have similar actions to aspirin. People with aspirin allergies are not advices to use it. The saponins contained in the plant can be irritating as well. Very nice delicate floret .. I love the shot of this flower, I honestly don't think I've ever seen it before. I still love flowers but have been focusing on birds. At our summer cottage you can see on my blog, http://angelgirlpj.blogspot.com/2012/05/pair-of-eagles-at-dewart-lake-syracuse.html, the eagles I've been watching. We also have so many more birds up there it is awesome.